"Smallville Attacks - Part One"
Conner is finally feeling at home, and at peace with the world, his mind wandering to his past. For the longest time he was hung up on the fact he never had a childhood, that he didn't know whether he was Superman or Lex Luthor deep down. His days in leather and sunnies, his time as a celebrity, his past in Hawaii, Tana, Roxy, Rex, Dubbilex and the original Krypto are behind him. He's not a clone, he's his own man - Conner Kent and for the first time ever he finally believes that. But inner peace is difficult to achieve and as Conner and Krypto enjoy the Kansas sights atop a silo, their peace is interrupted by Phantom Stranger. Stranger never comes with good news and indeed he warns Conner that his continued presence in Smallville will awaken something dark long hidden within the fields. He may be rebuilding his life but he must also prepare for the storm ahead. 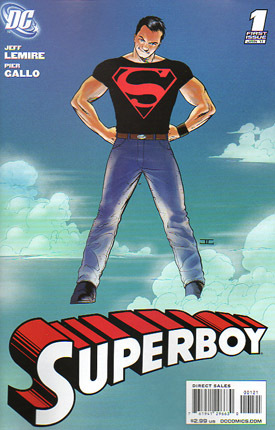 He tells Conner that he will appear to him a second time but that Superboy is needed. Needed he is, as Martha Clark Kent stumbles from atop a chair watering plants on her porch! With astounding speed Conner and Krypto race to the rescue and seeing her nephew with renewed stress, Martha quizzes Conner about his troubles. Martha asks him to put Phantom Stranger's words aside for now, since his return Conner has worked so hard to enjoy his life, his family, it may be a warning but it's not something to spend every waking moment brooding over. A dark evil does appear in Smallville however, leaving a trail of animal corpses in its wake, it seems to be searching for something and seeing a child playing superhero in the fields he narrowly misses his next meal, but he does find something that stirs his memory... a cape. Later Conner is in Smallville High playing the avoidance game with a girl at his school, Lori Luthor. At one time he was sweet on her, but finding out they were half related in a bizarre way after a confrontation with Lex Luthor sent Conner's mind into a spin. Ever since he can't spend more than ten seconds with the smitten girl. The evil stranger heads closer and closer to town draining life force from wildlife along the way while Conner's school day ends and he makes his way home. Outside the Diner an elderly gentleman carving a ball of wax draws Conner into conversation. It is the 154th anniversary of Smallville's founding and he warns Conner that he should learn more about his hometown and its secrets. A puzzled Conner accepts the carving as a birthday gift and walks away examining what looks like... Parasite? Simon Valentine distracts Conner. Simon was Conner's one friend in town when he first set up home in Smallville. Simon is a genius and socially inept geek rolled into one, (think Screech Powers with a quiff). Simon wants to share his newest discovery to an impatient Conner and whispers in his ear - that he knows Conner is Superboy! The revelation has to wait as Rudy Jones makes an explosive appearance smashing through Chevalier Hardware's front window. It seems Parasite, since escaping Project 7734, has been wandering, following the last trails of Superman's energy. Conner tears off his shirt to reveal his Super Tee and the two smash and crash through Main Street. Simon quick to strategize urges Conner to take the fight away from the populace. Krypto arrives and his jugular bite gives Conner a few seconds to recuperate before his Kryptonian powers vanish. Conner grabs Parasite and launches towards the Silo he was daydreaming on earlier. But it takes all his power to do so and now he faces a supercharged Parasite. None of his Kryptonian powers are able to kick in, so Conner turns to his one unique skill... tactile telekinesis. Spotting a nearby tractor he attempts to hurl it at Rudy but it proves too heavy. Parasite nears his target and Conner looks around the field for something, anything that he can use his TT powers on, there is nothing but grains as far as the eye can see, so Conner focuses and is able to attract thousands of the tiny grains to encase and drown Rudy till he loses consciousness. Simon and Krypto arrive and help Conner to his feet, the day's excitement is over, for a few seconds at least, as a now powerless Conner, Krypto and bewildered Simon are surprised by an earthquake! Suddenly the ground erupts and giant stalks wrap around the trio leaving them helpless. Through the giant crops a sad voice can be heard, Pamela Isley stumbles towards them crying out that she's too late to save Smallville! Story - 5: The Teen of Steel returns in a style his stories have never really enjoyed before. If anything this is directed more towards fans of Peter David and Supergirl/Linda Danver's adventures in Leesburg. There is a heaving mix of supernatural and superhero drama mixed in which Lemire expertly blends together that makes for an enjoyable read. There is a nice dash of angst drama thrown in via inner monologues and scenes with Martha and Lori. What's really good is that you really don't need to have followed Conner from his days as The Kid, or his days in the Teen Titans or even the recent Legion, or Adventure Comics run - it's all there in the first two pages. Conner even says it himself, "I'm kind of over it now... I've moved on". It is a gamble to do this kind of story, focusing on the supernatural. It's a big departure from the DCU run-of-the-mill stories and definitely a direction Superboy fans aren't used to. Luthor and Superman are name checked but don't appear which is a good thing. Too much of their history has overtaken the character so it's great that they are swept aside at least until Conner can grow a little more. I must admit I'm a little concerned about DCU villains popping up in Smallville, how they'll be written in, or if Conner will get a new series of villains like Sidearm. Conner has always been about big cities and big fights and big reputation. I'm a big believer in this new direction and, though a little reserved on its future, I await great things! I do think the title should have been called Superboy & Krypto: Adventures in Smallville but that's just me! Art - 5: There are moments when you might be forgiven for thinking Frank Quitely had a hand in the issue. I don't mean that as an insult to Pier Gallo, quite the opposite. It's a rarity when an artist can just 'get' a book. Here you find that immediately. The art sits beautifully with the story. There is a relaxed feel to the work that makes you really feel like you're right there in Smallville. The inks too, also lift the characters. I honestly felt immersed in the story and for that Piers Gallo and Jamie Grant I applaud your talent. Cover Art - 5: Pure awesome. 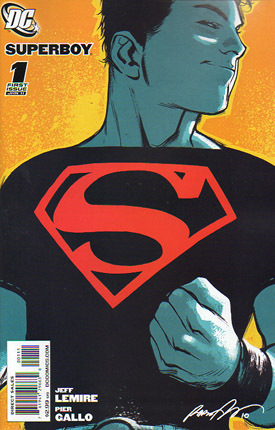 It is the best Superboy cover for a long while. He has the right amount of cheekiness to allude to his past and an attitude that (sorry Tiny Titans) says, "AWW YEAH!" I think it would only have been improved upon if it also featured Krypto. Cover Art (Variant Cover) - 4: I love the pose, I love the coloring, I think it looks great but the only thing I can't get my head around is Conner's face, and receding hairline. I feel it's the one thing that lets it down.